What is Happening to the UMass Old Chapel? This past Sunday, I had a rare opportunity to take a spin through the campus of UMass and visit the old alma mater. That’s twice in the past few months. I seldom get back to Amherst that often. I had my daughters with me. They’ve seen the campus before, but they were quite young the last time they were there and they barely remembered it. So, I had the chance to show them some of my favorite spots. It really doesn’t seem all that long ago that I was haunting the halls of UMass. And now, twenty years later, I have these two new people with me asking me questions about this building and that building and which ones I liked most. We gravitated quickly to the Old Chapel. I have addressed in a prior post how this building was played a large part in setting me on my career path as a historian. No hyperbole. Seeing a photo of campus c. 1892 with the Old Chapel prominently in the center motivated me to dig into campus history. Been researching the past ever since. I tried, in my limited capacity as a lowly undergrad, to attract attention to the fact that the UMass campus actually had a history. I encouraged my fellow students to visit the Special Collections and University Archives in the Tower Library (now W.E.B. DuBois Library) where there was always an interesting exhibit on campus history. I twisted arms and convinced obliging friends to go along on impromptu historical tours, introducing them to old buildings they had never noticed before (these tours were briefly “formalized” as a short-lived program, through the support of my boss at the Admissions Office). I published some articles on campus history in the Collegian. I even went so far as to piece together a “ghost tour” of UMass based on old articles I had dug up and stories I had heard from the older alumni. A few years ago, I learned that a version of this tour is now given annually by the UMass History Club which I think is splendid. Anything that raises an awareness of the fact that the campus actually has old buildings–-and buildings in need of preservation–-is a wonderful thing. So, I suppose that bit background is simply to point out the fact that I have a long-standing interest in the old buildings of UMass. Particularly the Old Chapel. The “Chapel Library,” as it was originally known, was built in 1885, the first library building of the Massachusetts Agricultural College. The first floor housed the library collection and the second floor housed an assembly hall in which the students gathered every morning. The hall was used at times for prayer services, but it was never exclusively a chapel or church, despite its appearance. The college eventually outgrew the small assembly hall and that function was taken over by Bowker Auditorium in Stockbridge Hall when that building was constructed in 1915. The building continued on as the library until 1935 (the institution by that time had changed its name to Massachusetts State College) when the second college library was built–the building now known as Goodell Hall. I have read that, before the move was made, the old Chapel Library was absolutely bursting with books. My favorite anecdote concerning the Old Chapel: the first student to be expelled from the University of Massachusetts (or the Massachusetts Agricultural College as it was called at the time) was dismissed for his role in a brawl that took place in 1890 on the winding wooden steps leading to the second floor assembly hall. Professor Charles S. Walker, the college chaplain, tried to break up the fight which involved most of the freshman and sophomore classes. He naturally went for the most burly of the students and tried to restrain him. Instinctively, the student spun around and slugged the man who had grabbed him, not knowing it was a professor. Harlan Fiske Stone, the first student to be expelled from the college, is now better known as the 12th Chief Justice of the United States Supreme Court. 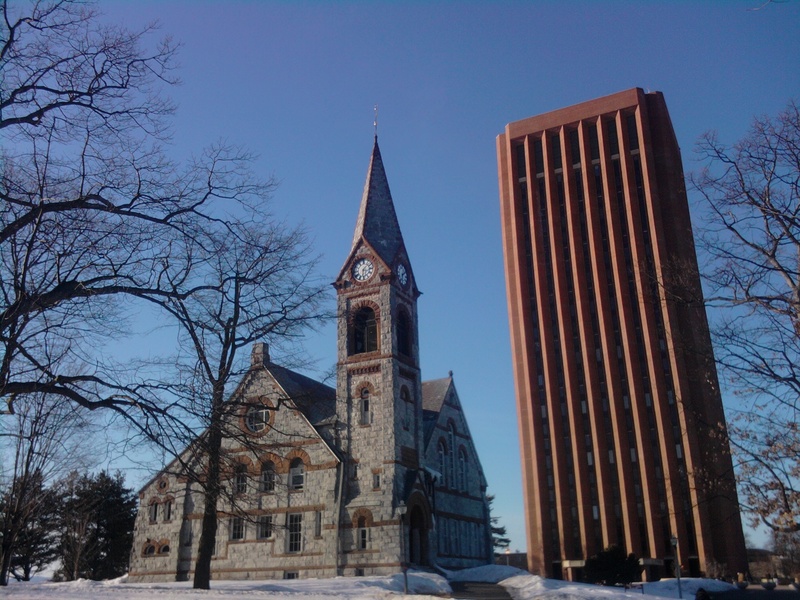 The Old Chapel has become the unofficial symbol of UMass Amherst. And yet it sits unused. During my time at UMass it was the home of the UMass Marching Band. I knew (and still know) several people who were in the band and I know how they loved that building. But how neglected the Old Chapel was at that time! I cringed when I went inside. When the band moved out in 1996, the building was closed up. And it’s been vacant ever since. In 1999 an effort got underway to restore and stabilize the exterior of the building, which was in danger of falling apart. You can read about the exterior restoration here. I applaud those who managed to secure the $1.65 million necessary to keep the building standing. It looks beautiful, far better than it did in the early 90s (on the outside, at least). As the article describes, Project Manager Richard Nathhorst has long been working on this effort to preserve the Chapel. He has created a splendid webpage here containing plenty of excellent historical information and some wonderful old photos. It sounds to me as though the University is very fortunate to have people like Mr. Nathhorst and others who are promoting historical preservation at UMass…particularly the preservation of the Old Chapel. The interior still awaits restoration. It has been closed now for 15 years. A matter of money, of course. The economy is rough, the job expensive, and I do not know, honestly, if there is a plan as to how the building would be used if restored. In short, I suppose this rambling article is my way of confessing my ignorance as to what has been going on with the Old Chapel at the University of Massachusetts. And I suspect that I am not the only UMass alum in that boat. I know there are others out there who admired and even treasured this building. I intend to pay a little more attention to the efforts to save this building at the heart of old UMass. In between my ongoing historical squibs, I hope to report back here as to what is happening with the Old Chapel. Update 2016: I encourage anyone interested in the progress of the UMass Old Chapel renovation to read the comments below. Since 2013, Mr. Joseph Larson of Preserve UMass has been posting informative updates in the comments section, which is much appreciated. The renovation is well underway (latest project summary can be viewed here) and the Chapel has been listed in the National Register of Historic Places. I look forward to getting back to campus this summer and seeing the work in progress.